Most ( over 90%) of all small redworm found in your horse will be encysted larvae. These will not show up on an egg count so the level of infection can be difficult to access, but because of the unique way Moxidectin (the active Ingredient in Equest) works. Equest is the only wormer licensed to control all stages of encysted small redworm in a single dose. 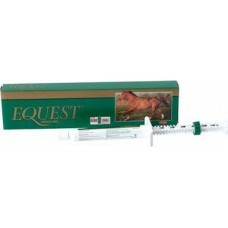 Equest also remains in the horses system for a further 2 weeks once treated thereby reducing the horses risk of re-infection and pasture contamination. Equest also has a lower toxicity to dung dwelling insects than the ivermectin based wormers. This again reduces pasture contamination as these insects help clear the pastures of dung. The longest lasting wormer available which treats against large and small redworms, large roundworms (ascarids) and seatworms (pinworms), lungworm and bots, except tapeworm. Moxidectin stays up to thirteen weeks in the body killing worm eggs and larvae for that period. Repeat every 13 weeks. No reported resistance. Controls all stages of encysted small redworms, that's inhibited and developing stages with a unique single standard dose - killing these larval stages before they emerge and cause potentially fatal intestinal damage. Kills approximately 80% of developing encysted small redworms with a single dose. Not suitable for pregnant mares and foals younger than 6 months. Withdrawal Period meat and offal 32 days. Manufacturer, Fort Dodge Veterinaria S.A. Carrreter. apply (a division per 25 kg liveweight). For 575 kg body weight.